You can turn your backyard into a retreat, no matter how much space you have to work with. You can use many different landscape features to make the most of the space that you have as well as improving the overall look. With a custom landscape design, you’ll end up with a yard that reflects your personal taste and gives you just the right areas for your lifestyle. 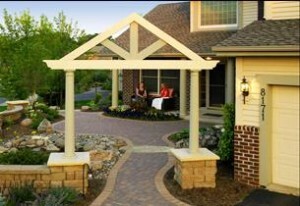 Hardscapes are structures such as rock beds, patios, walkways, etc. – natural materials that complement your ‘greenscapes’ or growing elements. Using hardscapes such as fire pits or even natural stonework throughout the yard are both ways to improve the overall look. An outdoor kitchen is also a very popular thing to add. Depending on the entertaining style that you have in mind, we can work with you to create the perfect entertaining space. With lighting, you might think it costs a lot but if you choose something with low voltages then you shouldn’t see an increase in the bill. It brings security along with it as well as a way to entertain well into the night hours. Highlight the backyard and the front yard using the right type of lighting. We can create a more dramatic effect on the outside by strategically placing the lighting through your yard to make the landscape pop. You should choose items that involve the maintenance level that you’re after. You might not want a large garden if you do not feel equipped to care for it. This includes the other items placed throughout the landscape as well. As you work with your landscape designer, make sure you discuss the maintenance level that you want to achieve. Now is the time to talk to ALD when it comes to adding more to your outdoor space to make it pop and have a great place to entertain and even just to relax and enjoy the outdoors without having to worry about not liking the area that you’re sitting in. We can provide you with your own custom design to ensure that you like every minute of being outdoors in your space.